This is my first post in India Broadband Forum and I want this post to be useful for other forum members. Recently You broadband in Chennai started migrating coaxial to fiber(GPON broadband). I'm happy to say i'm one of the luckiest customers to get GPON broadband and I want to share my thoughts. Earlier I've subscribed for 1 Mbps unlimited plan which I won't get committed speed and downtime most of the time. So, i thought of changing ISP to either Airtel or BSNL but You Broadband customer care called me and informed that now they are migrating coaxial to fiber broadband so there won't be any speed issues hereafter. It's been a month i've been using the GPON broadband and till no speed issue and importantly no downtime. The only problem as of now (Not all the time that too in Chennai ) is in case of power cut the box (Modem) which they have kept on terrace will not work and you have to wait until the power is restored. My Plan: 16 Mbps till 50GB then 768 Kbps unlimited @Rs.975/- per month. Everything else about You Broadband seems good, is their customer service any good? Sometimes there are service providers who have really bad customer service and its quite off putting. You broadband customer service in Chennai is fair. For most of the problems they will try to fix via phone itself. Netexpress broadband chennai, don't use this. 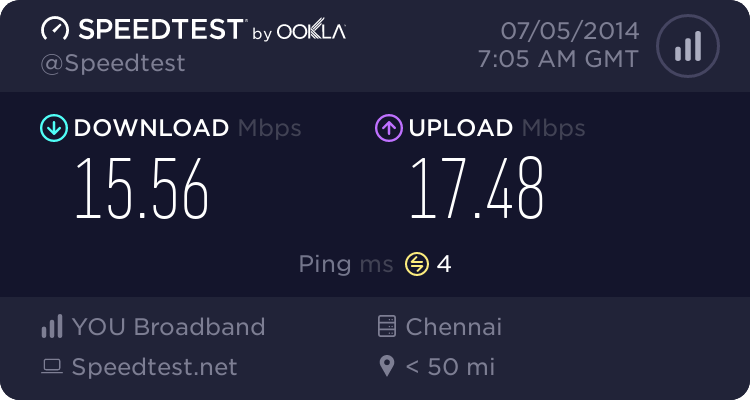 Which is the best broadband service in Chennai?